One of the primary goals of the Florida Cricket Conference is to establish a grassroots effort to develop youth cricket in Central Florida. The sport of cricket requires both individual and team growth, with emphasis in developing patience, technique, intelligence, and sportsmanship. To achieve this goal, Florida Cricket Conference is partnering with elementary and middle schools in the Central Florida area to provide free equipment and coaching sessions. Our goal is to create the next generation cricketer and to solidify cricket as a youth sport option in Central Florida. 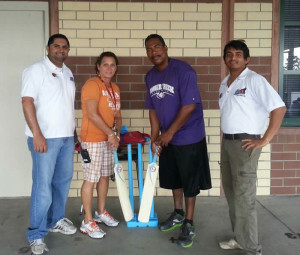 Florida Cricket Conference is also looking to enlist accredited youth cricket coaches to organize youth training camps and cricket competitions to teach the fundamentals of the game. Why an accredited coach? We at Florida Cricket Conference understand that the foundation to success in cricket is the quality of coaching at the onset. Accredited coaches must complete and pass stringent coaching programs, and continue to renew their certification to keep abreast of the latest coaching techniques and changing interpretation in the rules of the game. Coach all cricket disciplines at junior and intermediate cricket levels effectively. Use skill acquisition, assessment and latest training methodologies to improve techniques and skills.Develop and promote relationships that are conducive to the technical and personal development of young cricketers and development of more qualified coaches.